My name is Lacie Grayson and I want to hug Jennifer Lynch. As a woman who is in a creative field I empathized with Ms. Lynch. 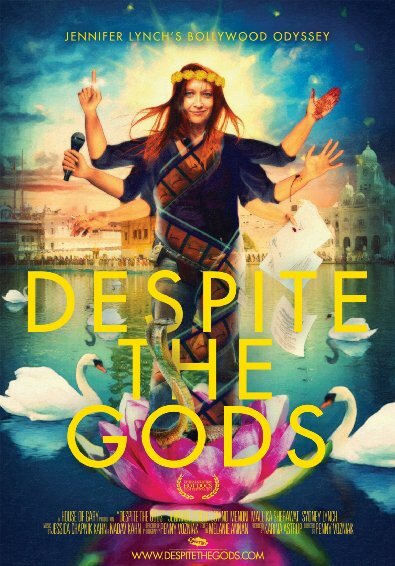 Despite The Gods is a documentary about the making of Hissss. (Which was not it's original title!) This is a documentary that is well worth watching no matter who you are. With the formerly mentioned film in mind, I'd like to offer a thought to Jennifer - if you ever read this: never read reviews. Never listen to critics just follow your heart. This documentary is the struggle of making a film in another country, in this case India. Language and cultural differences being the biggest hurdle, not forgetting her bald second director is a bit rude to her. Something she really doesn't let get to her until almost the end of the shoot. As you may (or may not) know this is not my usual type of review, but this film seemed too good to pass up. Usually, when playing Final Girl, I'm wrong - I pick the wrong girl. This time though, I was right. struggles to balance love life, creative life, AND yes, motherhood too. That maybe it's a unified sisterhood we never talk about. Yet despite the gods we are here creating, finding love and mothering. Images provided by Brinkvision. On VOD & DVD May 19th.